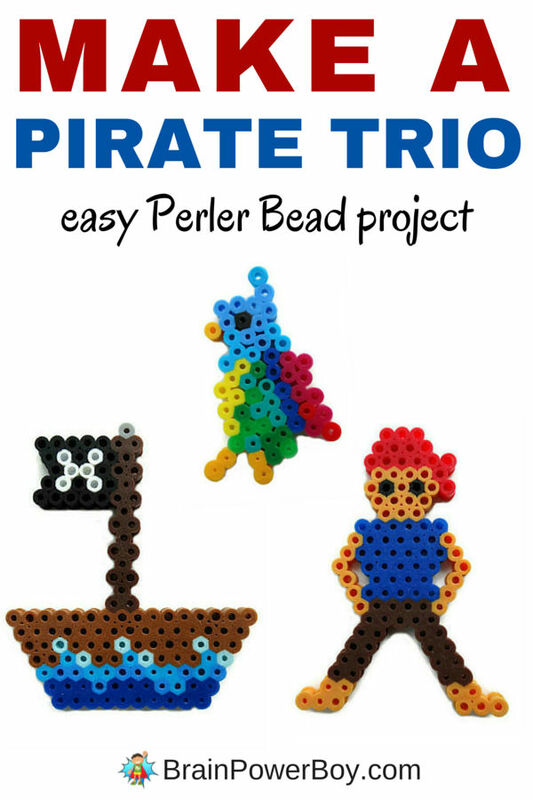 Today we are sharing a pattern to make a fun set of Pirate themed Perler Beads. 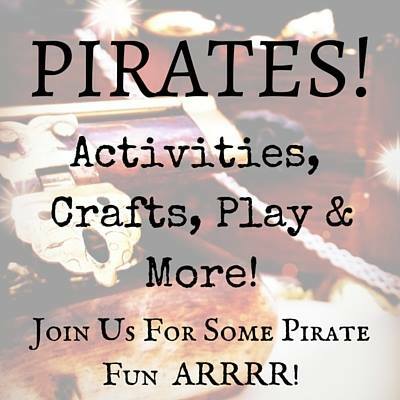 I was thinking about what we could make to share with you for the Talk Like a Pirate Day blog hop we are participating in and decided to try my hand at making some Pirate Perler Bead Patterns. Quite a long time ago I used to create things out of polymer clay and sell them at craft shows and in art stores. It was really enjoyable. Now I am finding myself getting rather obsessed with these colorful little melty beads and am also enjoying the design process. We are adding all of the Perler Bead Patterns we make right here on the site. So be sure to check back often. I hope you like how they turned out, mateys! Be sure to try your own designs too! Part of the fun of Perler Beads is the creativity. So . . . I dug into my crazy supply of beads and decided to make something pirate-y. I though I should point out that they are not to scale 🙂 The ship and the pirate are around the same size. You can’t get good detail on a piece if you go too small and I didn’t want to make a humongous ship. Perler Beads in many colors. See each item for what you need. Perler Bead Peg Board – I used a hexagon board. See additional information on the best Perler Bead Supplies. I am giving you basic instructions for making each piece. Please use the image for reference as well. The pirate is 21 beads high, 11 wide at the feet and 9 wide at the elbows. There are a few holes between the body and the arms at the elbow area so it defines the arms better. He has black eyes, red bandana, dark blue shirt, brown pants, and sand (not peach) skin. The ship is 16 wide and 21 high. The ship itself is 7 high. The mast is 14 high and the flag is 5 wide at its widest and 4 wide where it goes in. I sprinkled water colored blue beads at the bottom of the ship for 3 rows and then a few scattered up onto the ship. The colors used are black, white, grey, brown, light brown, dark blue, pastel blue, turquoise, and toothpaste. The parrot was so much fun to do. Let your kids put the colors wherever they want them to go – I did! The parrot is 14 tall from the tip of his toes to the top of his head feather. At his widest part he is 7 beads wide. I used black for the eye and cheddar for the beak and feet. The rest of the colors are pastel blue, dark blue, red, yellow, parrot green (appropriate eh?,) green, turquoise, and magenta. Make a line of one darker color just to the left of where you want the wing to go and make his belly a bright color. There you have it. An fun little Perler Bead project to do for Talk Like a Pirate Day, or any day! For more pirate fun click over to our huge pirate unit study. Go see it – there is a ton of pirate goodness there including games, ship info, weapons, books and much, much more. For more patterns like this pirate Perler bead pattern go to our Perler Bead Pattern Projects page which is linked at the top of this page. It has all of our pieces in one handy spot. What we use and on the far right the next beads I am hoping to buy. They are striped! Helen at Peakle Pie put together this awesome blog hop that I am so happy to be a part of. Be sure to check out the other pirate posts below from over 20 other bloggers. Thank you for digging up a treasure of an idea! Ye are a gem. My oldest found these beads this summer and has been making stuff nonstop. These patterns will be a addition to his collections! Thanks for linking up at #made4kids! Thanks for the invite to link up. The beads are just a tad addicting! I’m glad he is having fun with them and that he is adding the pirates to his list. My kids and their friends would have a blast with these!! Thanks so much for the patterns. I’m so glad to hear that Marie! You are most welcome. I must admit that I had thought of perler beads as an activity for girls, but now that I’ve seen some of your fun ideas, I think my boys could have a lot of fun with them! That is great to hear Judy. I hope they give it a try. We are certainly enjoying them. Watch for our Halloween perler bead patterns coming soon! An experienced grandmother bought perler beads and the peg boards for my then 3 year old. At the time I didn’t think it was very age appropriate, but I found out how wrong I was. This has kept my daughter busy many a times, and probably everyone I know has several heart and circle coasters made by daughter ;). Your pirate creations are quite cool. I’m going to show them to my daughter, hopefully she will want to graduate from happy faces and hearts and try something piratey :). Oh how cute that she made coasters for everyone Melanie! I have heard that kids as young as two really enjoy creating with them. My son was around 3 when we first tried them. I’m glad you like the pirate patterns.